Canopy beds are a classical timeless design. They work in adult rooms as well as children's rooms, especially if your space is in need of some upward visual interest. The Italian Canopy Campaign Bed - by Anthropologie (pictured in the photos above) - is by no means a true high at $1250 for a twin but as far as children's beds go, that is on the higher side. For a cheaper alternative open up a PB Teen Catalog. The Maison Canopy Bed is on sale now for $499 for a twin. A steal if you ask me. Some fun ways to dress up a bed like this include custom drapery around the metal frame as shown in the Isabel set from Serena & Lily below. 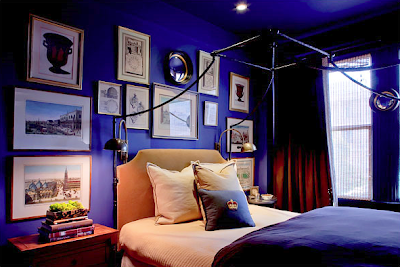 It even works in a more masculine room, Grant K Gibson used the Pottery Barn version and added a headboard for comfort and style. I personally love canopy beds and can't wait to get one for my daughter someday as I always wanted one. I think girls long for canopy beds and boys for bunk beds. What did you always want growing up in your room? Great post. 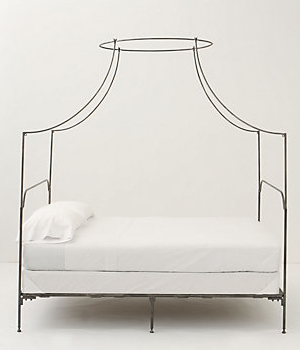 Love canopy beds! Acquire Baggit bags on the web searching for a fantastic knowledge. louis vuitton replica sale Hassle-free, effortless and also risk-free, bags on the web purchasing can abandon an individual content and also pleased. dior replica It is possible to take a seat inside the ease and comfort of your property, spot the buy Baggit bags as well as the merchandise will probably be brought to the front door. gucci replica sale An individual don’t must get coming from go shopping to search to select the particular carrier you wish. Usually these kinds of would not have any fastener. Any bag can be a stylish way of having your entire picked requirements. louis vuitton replica sale A variety of sorts & styles develop a bag the particular better accent regarding enterprise garments. dior replica sale No make any difference what sort of bag carrier you are searching for, quite a few forms of sorts and also styles are usually offered.